Introduction: How to play an attacking shot back past the bowler. Where is it used: The front foot drive is an attacking batting shot played to a ball that reaches the batsman at round knee height. Bring the bat straight down and hit the ball. Finish still and balanced with the bottom ofthe bat pointing towards the target. 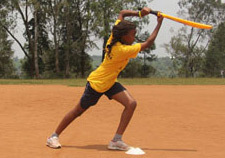 ABSTAIN from hitting the ball with a horizontal bat. PROTECT your wicket by hitting with the full face of the bat. Divide into small groups, one group per bat. In each group one player bats whilst the others field. The batsman hits ball from a cone, aiming to hit the ball through a goal of cones at least 6m in front of them (see picture right). Fielders stop the ball and return to the batsman who has a set number of goes before changing round. 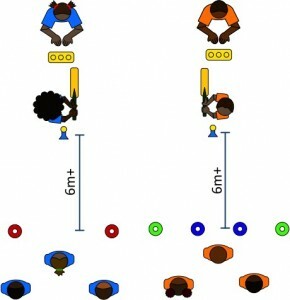 Have 6 hits each – how many times can each batsman get the ball through the goal? Have 5 hits per person in your group – how many times can your group get the ball through the goal? Have 1 go at a time as the batsman – howquickly can your group hit 10 drives through the goal? Add an extra smaller goal (see right), award 2 points for hitting through the small goal, 1 point for hitting through the big goal. Repeat the tests above with the new scoring system. © Copyright2016Cricket Without BoundariesProudly powered by WordPress | Theme: Gridster by ThemeFurnace.